This article is about geometric objects with a common center. For concentric muscle contractions, see Muscle contraction § Concentric contraction. For other uses, see Concentric (disambiguation). 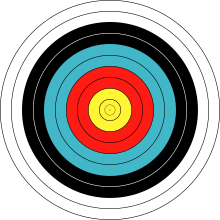 An archery target, featuring evenly spaced concentric circles that surround a "bullseye". In geometry, two or more objects are said to be concentric, coaxal, or coaxial when they share the same center or axis. Circles, regular polygons and regular polyhedra, and spheres may be concentric to one another (sharing the same center point), as may cylinders (sharing the same central axis). In the Euclidean plane, two circles that are concentric necessarily have different radii from each other. However, circles in three-dimensional space may be concentric, and have the same radius as each other, but nevertheless be different circles. For example, two different meridians of a terrestrial globe are concentric with each other and with the globe of the earth (approximated as a sphere). More generally, every two great circles on a sphere are concentric with each other and with the sphere. The circumcircle and the incircle of a regular n-gon, and the regular n-gon itself, are concentric. For the circumradius-to-inradius ratio for various n, see Bicentric polygon#Regular polygons. The region of the plane between two concentric circles is an annulus, and analogously the region of space between two concentric spheres is a spherical shell. For a given point c in the plane, the set of all circles having c as their center forms a pencil of circles. Each two circles in the pencil are concentric, and have different radii. Every point in the plane, except for the shared center, belongs to exactly one of the circles in the pencil. Every two disjoint circles, and every hyperbolic pencil of circles, may be transformed into a set of concentric circles by a Möbius transformation. The ripples formed by dropping a small object into still water naturally form an expanding system of concentric circles. Evenly spaced circles on the targets used in target archery or similar sports provide another familiar example of concentric circles. Coaxial cable is a type of electrical cable in which the combined neutral and earth core completely surrounds the live core(s) in system of concentric cylindrical shells. 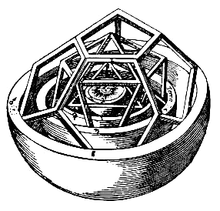 Johannes Kepler's Mysterium Cosmographicum envisioned a cosmological system formed by concentric regular polyhedra and spheres. Concentric circles are also found in diopter sights, a type of mechanic sights commonly found on target rifles. They usually feature a large disk with a small-diameter hole near the shooter's eye, and a front globe sight (a circle contained inside another circle, called tunnel). When these sights are correctly aligned, the point of impact will be in the middle of the front sight circle. ^ Alexander, Daniel C.; Koeberlein, Geralyn M. (2009), Elementary Geometry for College Students, Cengage Learning, p. 279, ISBN 9781111788599 . ^ Hardy, Godfrey Harold (1908), A Course of Pure Mathematics, The University Press, p. 107 . ^ Gillard, Robert D. (1987), Comprehensive Coordination Chemistry: Theory & background, Pergamon Press, pp. 137, 139, ISBN 9780080262321 . ^ a b Apostol, Tom (2013), New Horizons in Geometry, Dolciani Mathematical Expositions, 47, Mathematical Association of America, p. 140, ISBN 9780883853542 . ^ Spurk, Joseph; Aksel, Nuri (2008), Fluid Mechanics, Springer, p. 174, ISBN 9783540735366 . ^ Cole, George M.; Harbin, Andrew L. (2009), Surveyor Reference Manual, www.ppi2pass.com, §2, p. 6, ISBN 9781591261742 . ^ Morse, Jedidiah (1812), The American universal geography;: or, A view of the present state of all the kingdoms, states, and colonies in the known world, Volume 1 (6th ed. ), Thomas & Andrews, p. 19 . ^ Hahn, Liang-shin (1994), Complex Numbers and Geometry, MAA Spectrum, Cambridge University Press, p. 142, ISBN 9780883855102 . ^ Brannan, David A.; Esplen, Matthew F.; Gray, Jeremy J. (2011), Geometry, Cambridge University Press, pp. 320–321, ISBN 9781139503709 . ^ Fleming, Sir John Ambrose (1902), Waves and Ripples in Water, Air, and Æther: Being a Course of Christmas Lectures Delivered at the Royal Institution of Great Britain, Society for Promoting Christian Knowledge, p. 20 . ^ Haywood, Kathleen; Lewis, Catherine (2006), Archery: Steps to Success, Human Kinetics, p. xxiii, ISBN 9780736055420 . ^ Weik, Martin (1997), Fiber Optics Standard Dictionary, Springer, p. 124, ISBN 9780412122415 . ^ Meyer, Walter A. (2006), Geometry and Its Applications (2nd ed. ), Academic Press, p. 436, ISBN 9780080478036 . This page was last edited on 16 November 2018, at 16:26 (UTC).